Find the class below and then click the yellow “register now” button. Please remember the name, day and time so you can quickly find it in our online registration database. When sorting for classes on the registration page, be certain to select “session – term 6”. Hot Shots (ages 4-6): Advanced class focusing on kickovers, walkovers, round offs, handsprings, leaps. Bronze (ages 7-13): Beginning class focusing on handstands, standing and running cartwheels, bridges, kickovers, jumps. Silver (ages 7-13): Intermediate class focusing on handstands, round offs, bridge kickovers, handsprings. 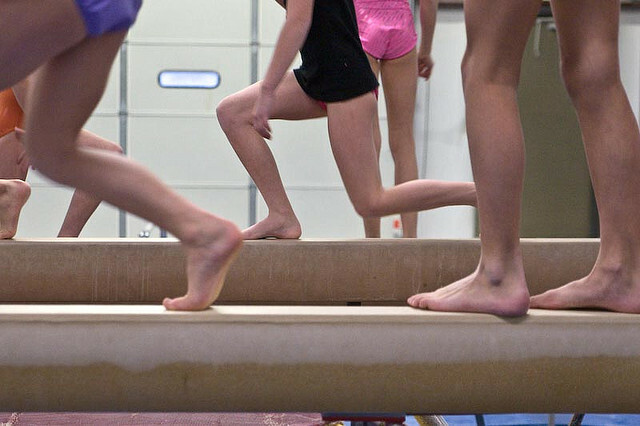 Gold (ages 7-13): Advanced class focusing on walkovers, handsprings, saltos, series tumbling. Tumble Time (ages 9-16): Intermediate class focusing on round offs & handsprings. Cartwheel & bridge kickover required. Advanced Tumble for Cheer (ages 9-16): Advanced class focused on tumbling passes and saltos. RO/BHS is required. * Development Programs-Competitive Team, Flipsters, Twistars, Advanced Challenge & Challenge, By invite only.